Lydia Peterson has been an intern here at Lokahi since January and has been writing about her experiences along the way in a personal blog. You can read a copy of one of her posts about our farm below. Feel free to click on the included link to see the original and read other posts. 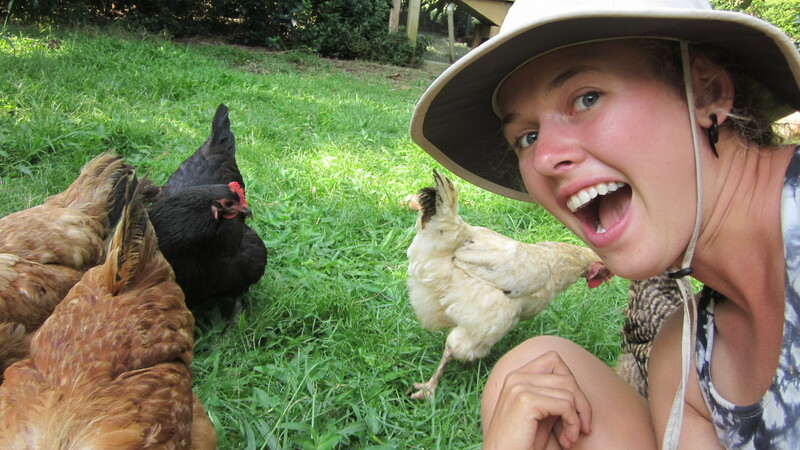 My great interest in chickens can be dated to one key, pivotal moment in my life. Northern Thailand. Two years ago. I was in a holistic development center designed to make rural life easier for the area’s hill tribes, and the lesson of the day for us American college kids was how to eat off the land. On the menu? Chicken. And I was responsible for butchering it. 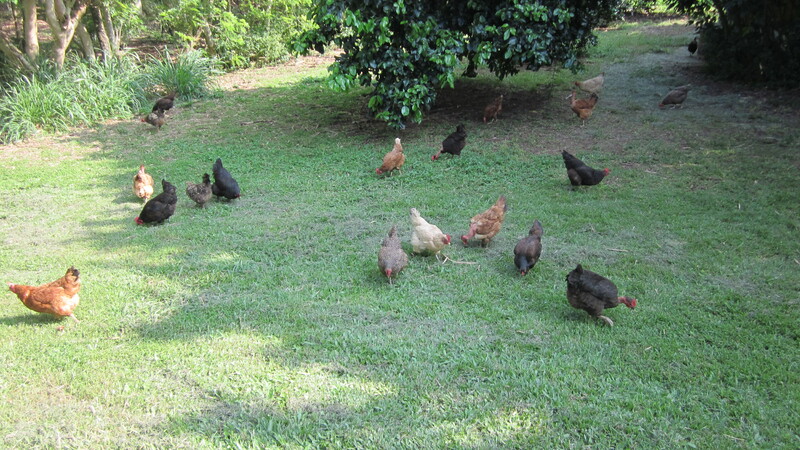 The center had an enormous chicken coop filled with very fast roosters. So fast, in fact, that they were impossible to catch. The Thai way to solve this problem is to render the bird unconscious by using a slingshot to slam a rock into the rooster’s skull, and then saunter into the pen to fetch it. Needless to say, I didn’t even bother to attempt this part. However, after the bird was fully knocked out by our Thai guide, it was deposited into my waiting arms and I began to walk it over to the butchering pavilion. This was my first time ever holding an injured, soon-to-die animal, and as I cradled it in my arms I was filled with deep emotion. I imagined I could sense the birds life force ebbing away, and I contemplated the courage I would need to take a knife to its neck in order to finish the job. It was a big moment for this city girl, and I was ready. The moment had arrived. I began to lower the bird to the chopping block, and as I did so, that injured, droopy bird sprang to life with more force than I ever could have expected and promptly scratched and pecked its way to freedom from my arms. In a flurry of feathers and obnoxious squawks, dinner had run away into the surrounding woods, and I was left empty handed. My shame in losing exactly half the of the meat our group was going to eat that day didn’t leave quickly, and I spent the rest of my time at the center chasing that stupid rooster through the woods with a slingshot and a bamboo pole. Numerous sighting, but I never came close to catching him. It’s a mournful thing to miss out on a chance to butcher, and I vowed to someday raise my own chickens with the intent of slaughtering them right. One chicken may have gotten away, but next time I would do it right. It’s been a long, slow process, but I can now proudly say that I can look at a chicken without instantly wanting to wring its neck. Whether this is evidence of forgiving myself or the bird is a moot point, because now I find them endlessly fascinating. 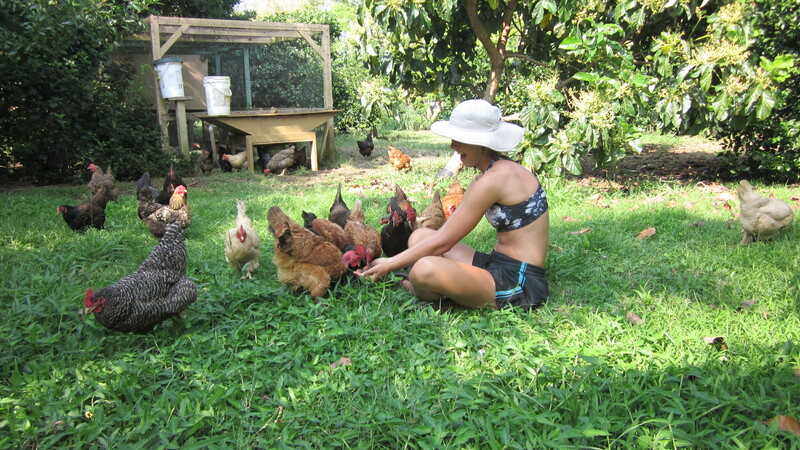 Here at Lokahi, Richard raises 30 laying hens, and tending to them is my responsibility. And what a great job it is. A very wise person once told me that my somewhat spastic personality would benefit from some “sit and see” time, or time where one simply sits and observes everything they can about one particular aspect of the landscape, usually a tree. I’m marrying this wise person so I’m willing to take him seriously, but after staring at a tree for about three minutes I knew that they weren’t stimulating enough for me. 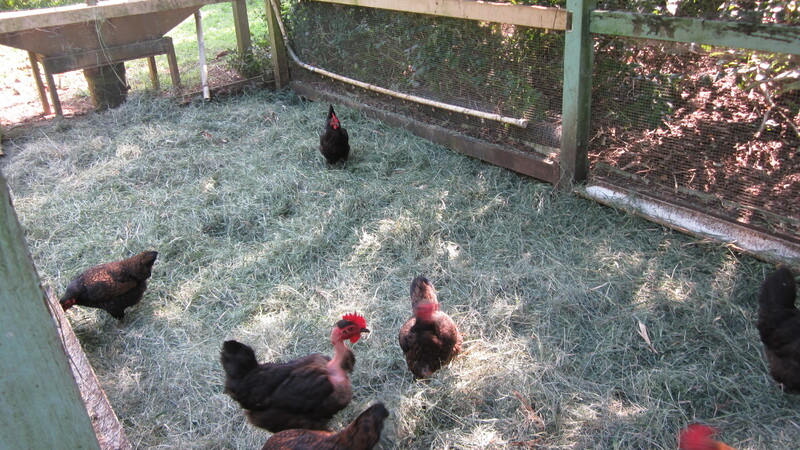 Instead, I’ve been taking a few minutes out of every day here at Lokahi to sit and watch the chickens. It’s been freaking mind blowing. 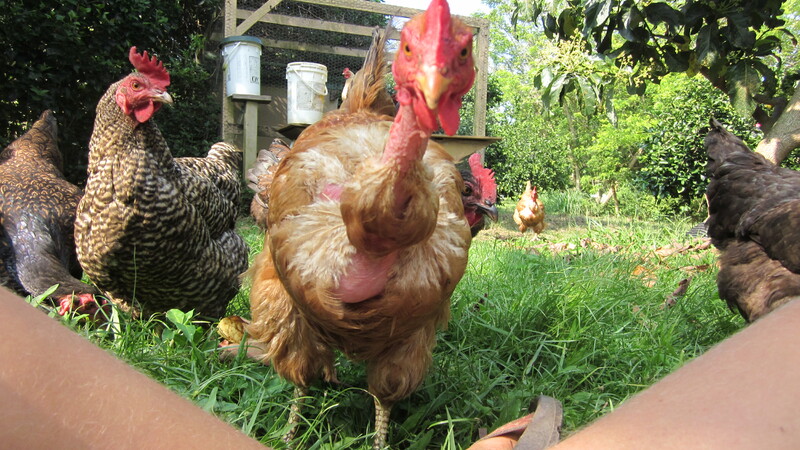 Chickens are seriously the best. 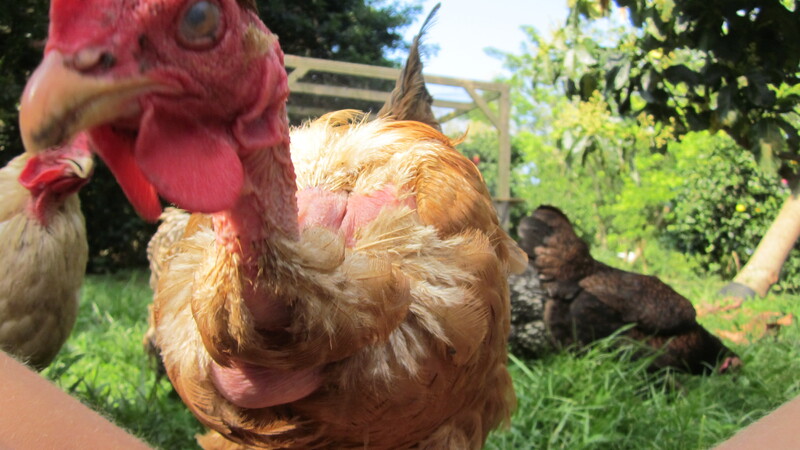 First, pecking order is a real thing. These birds truly hate some of their fellow flock mates, and these poor suckers have been pecked to neck nakedness. Broodiness is also a real thing. 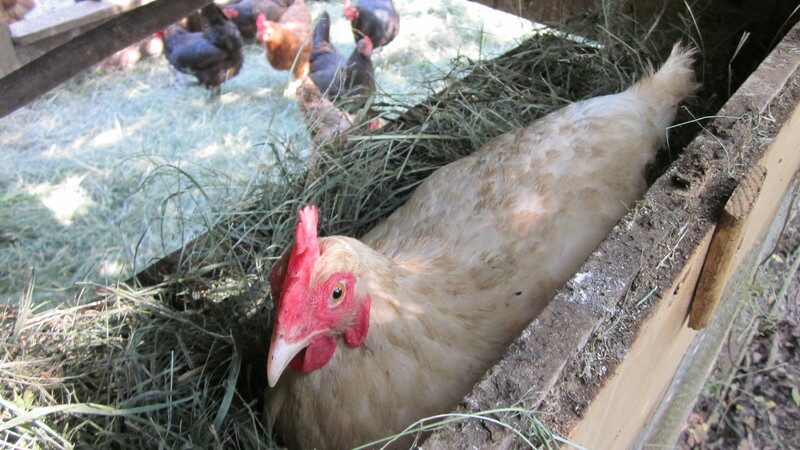 The more family-minded of these ladies get really moody and obsessed with their nests full of eggs, squawking grumpily at me when I move their fluffy rears to get at them. To be honest, they remind me of pms-ing college girls. I can watch those birds for hours, and I swear everyday they make some new shrieking noise or freak out about a new disgusting tidbit in their compost bin. These gals are my pals, and today intern Sarah caught me bonding with them and captured some photo evidence. I’m posting them here just to prove I’m not ashamed. But really, it’s a little depressing that I’m already a little sad about eventually saying goodbye. But next time I bond with birds, they will be my own. 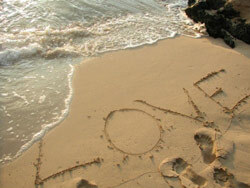 And I can hardly wait. Though, I’ll have to butcher at least one, just to prove to myself I can. 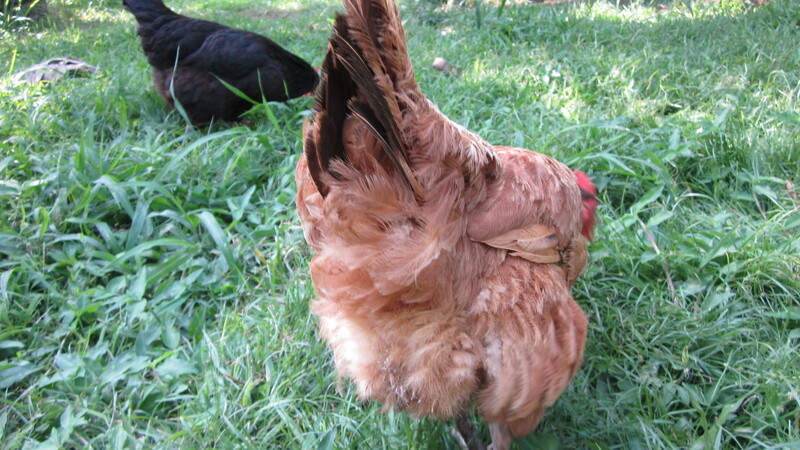 Since writing this post I have learned that the lack of feathers on some of our chickens’ necks isn’t because of violent behavior, but is actually a breed characteristic of the naked neck variety. Apparently these birds tend to do well in hotter climates and are preferred because of how easy they are to pluck. Who knew?! 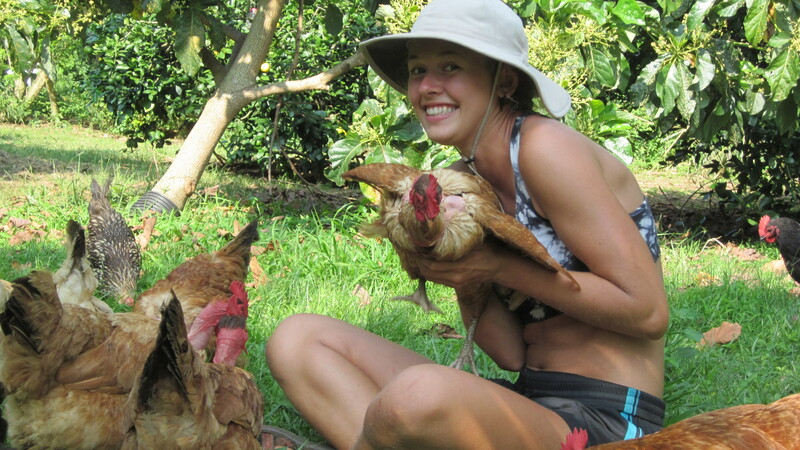 Lokahi Garden Sanctuary, located on the Big Island of Hawaii, offers authentic "Hawaii Healing Vacations" through its two extended stay programs. One program focuses on holistic healing while the other program focuses on wellness. For more information contact us. Admin on Where is the Lokahi Garden Sanctuary? Rachel M on Where is the Lokahi Garden Sanctuary?